Is this simply left over from all SE sites growing out of Stack Overflow? These three really are not good questions. They don't help other people later, and they don't much help the asker now unless the answerer happens to provide a ton of detail that wasn't explicitly asked for. what X should I buy? are X's with Y worth the extra money? should my X have a Y? These three are better. They may still involve opinion (how important is a window in a tent, how heavy is too heavy for a backpacker, how cold or warm is too cold or warm) but they have some objective component and they aren't asking us to make a decision for the asker. what difference does it make if my X has a Y? what are the advantages of a Y for my X? How do I decide about a Y for my X? We can close the first three as primarily opinion based and encourage them to be edited into something more like the last three. SO was created as a response to programming forums. These forums provide opinions not answers to questions. SO (and therefore SE) was created in response to the frustration of not finding a good answer to a good question. Just lists of people contradicting each other. TGO should be the same. TGO should be based on facts and not opinions. There are many outdoor forums where opinions are great but TGO should provide answers to questions based on facts not opinions. This is what differentiates us from everyone else. 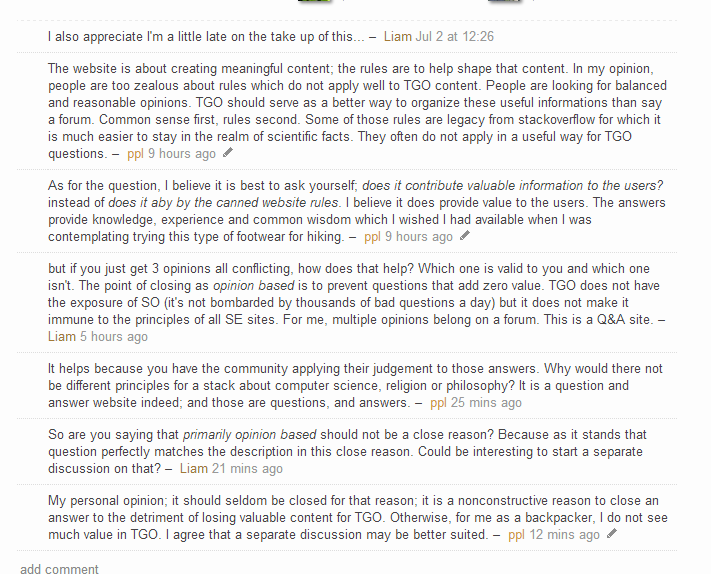 As stated here questions of this nature should state the problem they are facing so that users can provide an answer. Asking for opinions is not a question nor a problem. I know we want to grow the community but this should not be at the expense of the SE ethic. All the other sites abide by this rule, why are we any different?